You can turn on your TV as early as 9:00 AM to begin hearing tips from the handicappers. There are several shows on Channel 12 with two hosts who rarely agree on selections. Depending on how many horses they choose – three or four, each show is different – you are most likely to collect six or seven names to bet, which is like collecting no selections at all. Why does anyone watch? Well, the answer is horseplayers can’t turn their back on information. Here, in Saratoga, picking winners is tough enough to go it alone. Only two favorites, including Midnight Watch in the featured $100,000 Riskaverse Stakes, won on Friday. Poor John Pricci, a horseplayer par excellence, for example, hasn’t had much luck with his Bet of the Day on Channel 13’s evening news show. But, no doubt, he’ll be renewed for next season. There are shows on which hosts interview horse racing insiders, too, and it’s amazing how the producers are able to attract top shelf people. Last night, for example, a NYRA radio host was able to convince trainers D. Wayne Lukas and Todd Pletcher to appear on a broadcast from the Parting Glass tavern on Henry St. – quite a coup. Next Monday morning, Seth Merrow, the host of Racing Across America on OTB-TV, will have Ken Ramsey on – happens all the time. Post time for the first race was 2:30 PM, causing a few disgruntled restaurant owners in town to complain that they missed turning their tables twice. 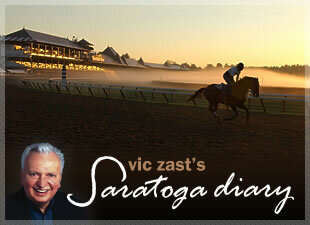 Another special ceremony (Saratoga Racecourse has hundreds) took place shortly after 4:00 PM. 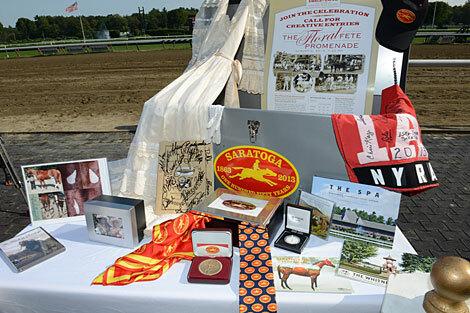 Items commemorating the 150th year of horse racing were placed in a time capsule that is to be buried at the racecourse. 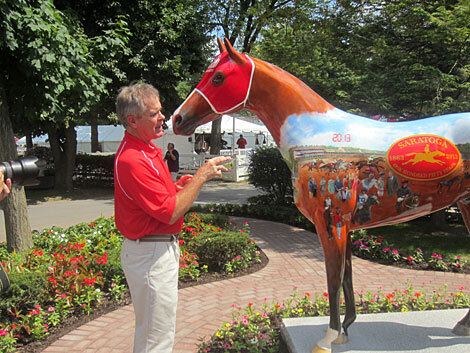 Robert Clark, the artist who decorated the fiber-glass horse which stands at the West clubhouse entrance was given his due. Robert Clark, artist of the new fiber-glass sport at the entrance to the Clubhouse. The first race was an overnight stakes named the Law Enforcement. Three runners attempted to escape from two others, setting the end up perfectly for jockey Luis Saez aboard the closer Free Mugatu. NYRA ran a video about the late Hall of Fame trainer T.J. Kelly afterward. Saez doubled in the Double aboard Sidearm. How nice, albeit short-lived, it was to see veteran campaigners meet in the third race and to have the public as excited as it was for horses that weren’t Eclipse Award or Breeders’ Cup candidates. The race set up ideally for Ramsey’s 20th winner of the meet Bernie the Maestro, as opposed to the more celebrated participants Caixa Eletronica and Saginaw, and when Saginaw pulled up on the turn, the race ended prematurely. Fans of the 7-year-old NY-Bred gelding on Facebook and Twitter immediately set off the alarm and prayers began. 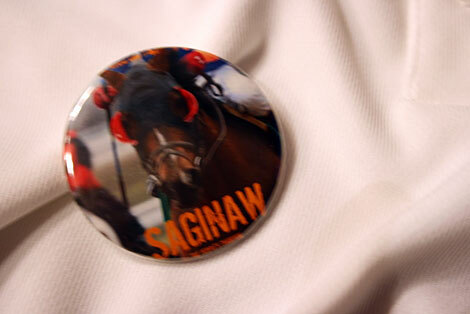 Saginaw put down after third race accident. There was much concern for the policies of NYRA regarding the welfare of horses and jockeys when the Governor of New York pulled off his takeover. Still, not a peep as equine deaths pile up and people lie in hospitals while the State is in charge.